A. Release of paddlefish, trout, striped bass and/or striped bass hybrids caught and placed on a stringer, in a livewell, or otherwise held in possession is prohibited, statewide (no culling). B. Alligator gar may be caught by use of rod and reel, trotline, and throwline. Alligator gar taken by bow and arrow, gigs, spears, or spearguns cannot be released. Alligator gar caught and placed on a stringer cannot be released (a practice called culling). Harvest must be reported to the Wildlife Department (405) 325-7288. C. It is unlawful to take or possess more than 25 nongame bait fish in rivers or streams, except for shad, of which 200 may be taken or possessed. E. Daily limit is 1 for any fish species of special concern in category I or II, which includes alligator gar, black buffalo, shovelnose sturgeon (see Title 800:25-19-6). Such harvest must be reported to the Wildlife Department. F. In rivers and streams the daily limit on black bass is 6 combined (largemouth, smallmouth and spotted), all of which must be 14 inches or longer and only one of which may be a smallmouth. Some areas have different regulations. See “Public Fishing Waters” special regulations for daily and size limits on specific areas. Check “Public Fishing Waters” special regulations for areas with additional daily and size limits. State record: 14 lbs., 13.7 oz. State record: 8 lbs., 7 oz. State record: 8 lbs., 2 oz. 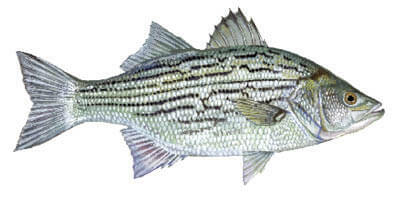 Tooth Patch: Another way to distinguish black bass is the presence or absence of a tooth patch on the tongue. The majority of largemouth bass have no tooth patch on the tongue, while smallmouth and spotted bass do have a tooth patch on the tongue. Most largemouth bass have no tooth patch on the tongue. 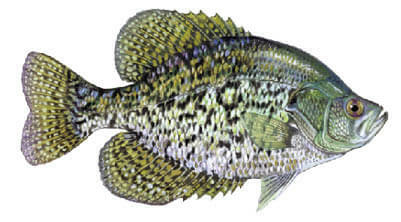 Smallmouth and spotted bass display a tooth patch on the tongue. For noodling limits, see Method of Take. State record: 35 lbs., 15 oz. State record: 78 lbs., 8 oz. State record: 4 lbs., 10 oz. State record: 4 lbs., 15 oz. When mea­sur­ing fish, total length is mea­sured from the tip of the snout to the end of the tail, with fish laid flat on a ruler, mouth closed and tail fins pressed together. 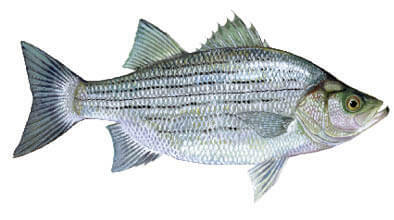 Culling of striped bass and/or striped bass hybrids is prohibited. State record: 47 lbs., 8 oz. State record: 23 lbs., 4 oz. State record: 4 lbs., 9.6 oz. Check Trout Regulations for areas with additional daily and size limits. Culling of trout is prohibited. State record: 11 lbs., 4.32 oz. State record: 17 lbs., 4.6 oz. State Record: 12 lbs., 13 oz. State Record: 5 lbs., 5 oz. Harvest must be reported via E-Check at wildlifedepartment.com. Check Paddlefish Regulations for additional information. Culling of paddlefish is prohibited. State Record: 132 lbs., 8 oz. Harvest must be reported to Wildlife Department (405) 325-7288. State Record: 254 lbs., 12 oz.